Today I got a big parcel from Maxine and we had such fun opening it! 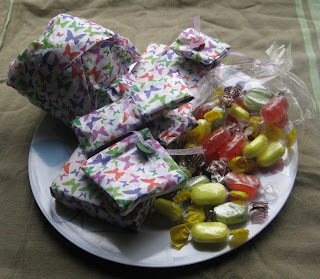 Everything was beautifully wrapped and tied with buttons and ribbon. Mmm, old-fashioned sweeties - my favourite. What could be inside all those neat little packages? Look what I got! Green & Black's chocolate bars (yum! 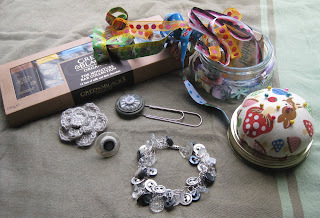 ), a jar filled with buttons and ribbons with a pincushion top (just what I needed! ), a charm bracelet in greys, whites and crystals (gorgeous! ), layered ring (matches my dragonfly brooch), crocheted flower brooch (will look fab on my green coat) and button-topped giant paperclip (how did you know I needed a decent bookmark for all my travel reading this weekend?). Just lovely. I love neutrals, black and silver and these will go with pretty much everything I own. The jar is filled with sweet tiny pastel buttons and cute Japanese style ribbons - I'm having to fend K off with a big stick at the moment as she wants them for her own stash - and little ideas are fermenting in my head already. So a very big thank you to Maxine for all her work and to Sam from Incy Wincy Stitches for kindly hosting the swap. I've thoroughly enjoyed it and found a new dimension to my making. Can't ask more than that! Now to crack on and finish the 80s Fantasy Film swap and complete a costume for a toy cat before the weekend...yes, I am slightly mad. What a lovely parcel, and a fab bookmark idea - another one i'll have to 'borrow'! lovely stuff! i really really love the pincushion jar - i bought a jar months ago to make one - must crack on! Great parcel of goodies!!! Fab!